William Seward is an ancestor of whom I know very little, but thanks to Google Books, I’ve found that he certainly set a great example for his descendants to follow. He was born circa 1627 in England, and immigrated from Bristol, England to Taunton, Massachusetts in 1643. He later settled in New Haven, which was still part of New Haven Colony which would later be part of Connecticut. William married Grace Norton of Guilford (daughter of Thomas Norton and possibly Grace Wells) in New Haven to April 2, 1651. It seems that he moved to Guilford sometime after 1652 and took the oath of fidelity there on May 4, 1654. By trade, William was a tanner who did well for himself. He owned plenty of property and enjoyed good standing in town. William’s name comes up often as a leader in the early history of the town. On June 1, 1665, he was appointed captain of the guard in Guilford. He served as a deputy between 1674 and 1685 and as representative to the General Assembly in Connecticut between 1683 to 1686. *Abigail, Judith and Lydia Bushnell were sisters. William died on March 29, 1689 (age 62) (some sources say March 2). Grace died March 5, 1704. Sadly, I don’t know where either of them are buried, although I am sure it is somewhere in Guilford. Thomas Strong was born on November 17, 1722 in Northampton, Hampshire County, MA. He was the second son and fourth child of Eliakim Strong and Mehitable King and was probably named for Eliakim’s father Thomas. He moved to Durham, New Haven County, CT as a child, sometime between 1725 and 1730. There he became a farmer and married Phebe Seward on January 16, 1746. Phebe Strong grave, Old Durham Cemetery. Author’s collection. Either he or his son Thomas took Oath of Fidelity to State of Connecticut on August 26, 1777 in Durham. I suspect that it may have been Thomas, Sr., since the “History of Durham, Connecticut” does note the juniors who took the oath. This leads me to believe that the family, like so many in Durham, supported the Patriot cause during the American Revolution. Thomas’ wife Phebe died in February 3, 1787 and is buried in Old Durham Cemetery. He moved to Whitestown, Herkimer County, NY, likely when his youngest son Nathan moved there in 1794-1795. Thomas died in Whitestown, by then Oneida County, NY, likely before 1810 when Nathan moved to Rodman. I don’t know the date of death or where he was buried, due to New York State’s scant vital records at that time. We’ve arrived at the end of the Scranton line in the “New World”! One thing I’ve discovered is that when you trace your lines back to this point, you may find books and articles written about your ancestor, but just like online family trees, you also find plenty of conflicting information. Which only goes to show that there is nothing like finding original primary sources or at least sources contemporary to your events. I’m saying all this because I’ve found quite a bit of information on John Scranton, the forefather of my Scranton line, but some of this information does not agree with each other. What I’ll attempt to do is tell John’s story as best I can, trying to note conflicts where I’ve found them. John Scranton’s birth was estimated to be around 1609-1610 in England. It is possible that he may have lived in Guildford, England with his fellow immigrants. (Guildford is a town that is 27 miles southwest of London.) While in England, it is thought that John married his first wife Joanna (whose last name is unknown). When John left England is uncertain. I’ve seen an article state that he and others left in 1637 for Boston, Massachusetts; another stated that he was among the twenty-five families that traveled with Henry Whitfield to New Haven in May of 1639, to later take part in the “Fundamental Agreement” that formed the government of New Haven Colony. As his name is nowhere on the document, I think it was unlikely. I feel that the article that stated that John arrived in a second ship that arrived in New Haven in July 1639 is a more likely conclusion. Whenever he actually arrived, he was among a number of families that left England to escape religious persecution from the Church of England. He is credited to be among the original group who settled in Guilford Plantation on October 10, 1639. (Today, Guilford is a shoreline town that is bordered by Branford, North Branford, Durham, and Madison. I’m sure it took up most of these lands during its colonial days.) Minister Henry Whitfield was the leader of the settlers. Whitfield’s stone house (which also doubled as a fort and likely the settlement’s initial church meeting place) still stands. The early settlers helped build the house, so I have to wonder if John Scranton was one of them. Certainly he must have spent some time there. Henry Whitfield House, the oldest stone house in New England. Courtesy Wikipedia. One account I read said that John Scranton first had two acres on East side of State Street. It’s unclear whether it was here or in the “Hammonasset Quarter”, where he moved in 1656, where he experienced success as a farmer, though I suspect it was the earlier spot. It was John who started the practice of cutting down trees (as opposed to digging them up) to clear the land before planting his wheat. He had “…astonished the people by gathering from [his acre of land] twenty bushels”. John was admitted as a freeman on May 22, 1648. He later served as a Marshall from 1661 to 1662, and then as a Deputy to the New Haven Colony court during the “extra session” of January 1664. Soon after, New Haven Colony merged with Connecticut Colony. Joanna Scranton died July 22, 1661. Less than two weeks after New Haven County was formed, John remarried Ada or Adaline (most recently widowed by Robert Hill) on May 22, 1666. John continued in public service as a Deputy to the General Court in 1669 & 1670. He later died on August 27, 1671. Being the closest ancestral land to where I live now, I’m probably long overdue for a trip to Guilford. I would love to visit the Whitfield House and walk on the land where my ancestors walked. Perhaps if I’m lucky, I will find some records that will clarify John Scranton’s life. Thomas Scranton was born circa 1643 in Guilford, New Haven Colony. (Guilford is currently in New Haven County, Connecticut.) He was the second son and child of John Scranton and Joanna (last name unknown). He was a farmer who lived on his father’s lot. There may have been more children, but I have very scant information on this family. Deborah died in October 1681, and Thomas later married Elizabeth Goodrich or Griswold. He died on November 10, 1711. Thomas made his will on March 10, 1710, and it was exhibited in probate court November 30 – December 1, 1711. I don’t know where he was buried, but I’m sure it was in Guilford. Samuel Scranton was the firstborn son & child of Thomas Scranton and Deborah (Dudley) Thompson, born in the later part of the 1600s in Guilford, New Haven County, Connecticut. Elizabeth, born August 20, 1713; married Eliphalet Hall, January 1, 1735; died April 15, 1742. Thomas, born May 28, 1715; married Mary Parmalee, December 28, 1736. Hannah, born October 14, 1716; married Eleazar Evarts, either on January 29, 1739/40 (per the Barbour Collection) or on August 29, 1740 (per “A Genealogical Register of the Descendants of John Scranton”, compiled by Rev. Erastus Scranton). Samuel, born March 24, 1720; married Mary Fitch, March 5, 1747. Timothy, born May 1722; married Abigail Torrey, November 23, 1748; married Anna Fields, December 15, 1779; married Comfort Richmond, November 15, 1797. 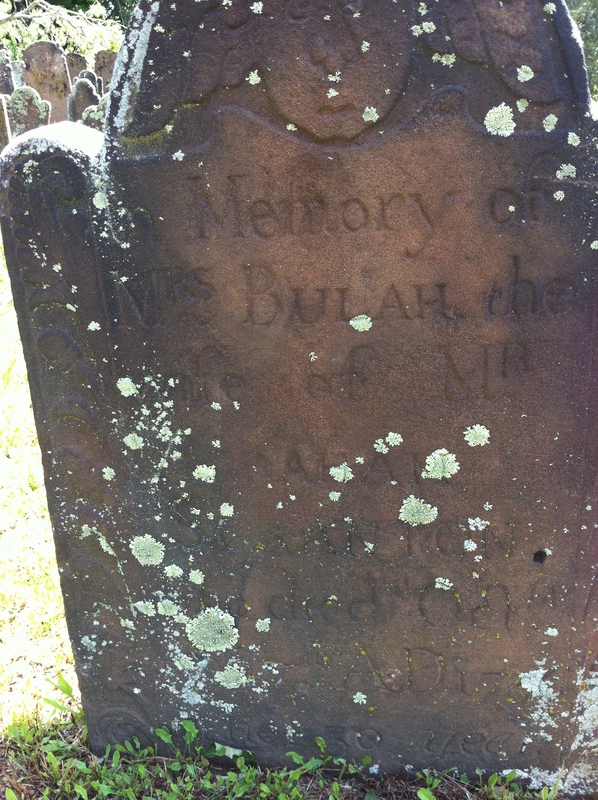 Abraham, born 1724; married Beulah Seward; married Eleanor Picket, May 10, 1757; died May 5, 1780. Sarah, born 1726; married Thomas Stone, June 17, 1747; died Jan 28, 1772. Lucy, born 1728; died December 7, 1736. Samuel died on March 18, 1750. According to Find a Grave, he is buried at West Side Cemetery in Guilford, but there is no photograph of the stone, and the memorial shows a death date of March 25, 1750. I almost was ready to just post a simple sketch of Scrantons going back to England when it seemed like David Scranton was telling me, “Wait! There’s more!” As I took a closer look, I found there were more stories to be told, this time about David’s father Abraham. Abraham Scranton, the fourth son and sixth child of Samuel Scranton and Elizabeth Bishop, was born 1724 in Guilford, New Haven County, Connecticut. He was the first Scranton to settle in Durham sometime before December 1749. Abraham, born December 3, 1749, died January 28, 1836. He married Hannah Camp on January 1, 1772 in Durham (she died April 18, 1796). Abraham served in the Revolutionary War as a Lieutenant. After the war, he served on the Connecticut General Assembly. On January 1, 1811, he married Louisa Fairchild, who later died during January 1839. David, born October 27, 1751, died March 5, 1838 in Manchester, Nova Scotia. More information on David can be found here and here. Enos, born 1753 (baptized November 25, 1753); died October 1, 1754; buried in Old Durham Cemetery. Beulah died in 1756, when young Abraham was only seven and David was four years old. I had never noticed this before, and I wonder how it impacted his sympathies for his daughter Phebe when her mother died. Beulah (Seward) Scranton’s grave (here spelled Bulah), Old Durham Cemetery. Author’s collection. 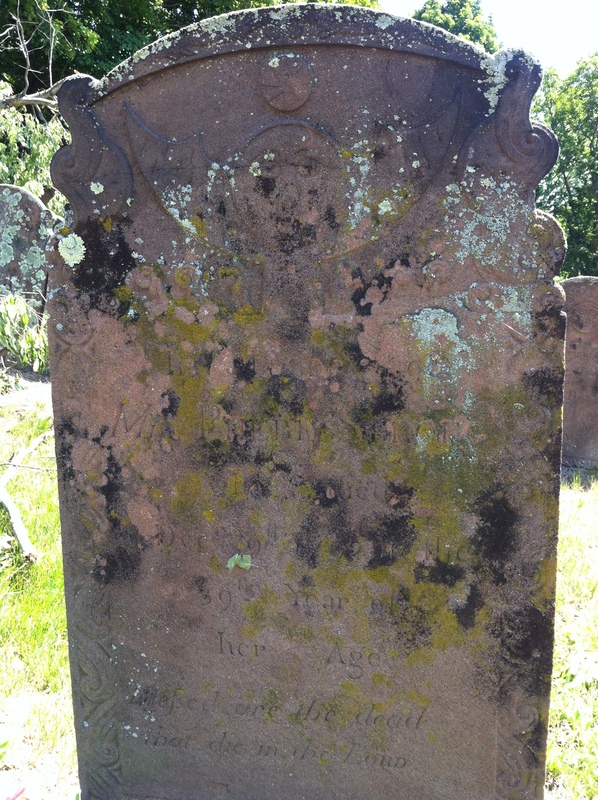 Ichabod, baptized March 12, 1758; died October 29, 1760; buried in Old Durham Cemetery. Ichabod born on August 31, 1762; married Rachel Seward, who died August 1819. Once she passed on, Ichabod moved to Vincennes, Indiana, and then to Terre Haute where he died in 1823. Abraham Scranton’s grave, Old Durham Cemetery. Author’s collection. 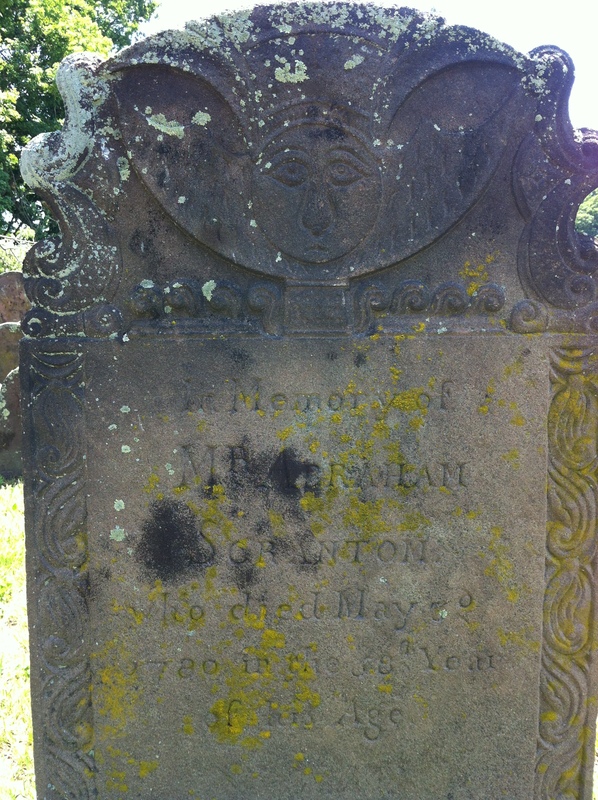 Abraham passed away on May 3, 1780 in Durham at age 56. He is buried in Old Durham Cemetery. When his estate was settled on July 3, 1780, his eighteen-year-old son Ichabod was left under his half-brother Abraham’s guardianship. Elennor later died on April 26, 1797. 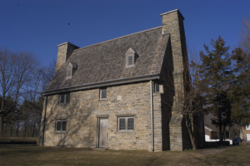 Fifth Great-Grandfather David Scranton: Patriot or Loyalist? I’ve seen a few old inquiries on the internet, asking if David Scranton was a Loyalist during the American Revolution. It’s a fair enough question, since he moved to Nova Scotia shortly after the war and transported a number of Loyalists with him. Also, he is not listed on the Daughters of the American Revolution Ancestor Search database. Because he moved to the British territory of Nova Scotia, David probably never could have applied for a Revolutionary War pension, so I would not find him in those types of records. However, all this is not enough to draw a conclusion. The following is what I’ve found. In the book “Record of service of Connecticut men in the War of the Revolution” (page 614), David Scranton of Durham is listed as one of the ensigns in Colonel Ely’s State Regiment during June 1777. Other officers included Lieutenant Colonel James Arnold and Major Elias Buell. I found further evidence in Asa Burdick’s Revolutionary War pension application affidavit. Asa was part of a company in New London, Connecticut, commanded in June 1777 by “Captain Collins, Lieutenant Taylor and Ensign David Scranton, in a regiment commanded by Col. Ely and Lieutenant Col. Arnold.” The company was involved in building the original Fort Trumbull at New London. In another Revolutionary War pension application affidavit by Abiel Baldwin, Abiel was part of team in 1781 that transported beef from Durham to Fishkill for the troops there, under David Scranton’s direction. In William Chauncey Fowler’s book “History of Durham Connecticut,” David was among those chosen on February 27, 1782 from Durham as part of a committee to put together a regiment to defend Horse Neck & the western frontier. (Today, Horse Neck is now known as Field Point in a very exclusive area of Greenwich, Connecticut along the coast.) Now although the British formally surrendered at Yorktown, Virginia on October 19, 1781, there were still British troops in New York City (a relatively short distance from Greenwich) until November 25, 1783, so I presume the local militia stayed on alert until that time. So how did David and his family fare during the War of 1812, where there was a lot of hostility along the US/Canada border and at sea? I couldn’t find any mention of him in any kind of service in the war. Even though he was over sixty, he would at least have opportunity to donate supplies or support the cause of the British if he had chosen to do so. Much of New England, including David’s home state of Connecticut, did not support the US government’s decision to go to war with Great Britain. In spite of this, the British did attack Essex, Connecticut (only a few towns away from Durham) in 1814. On a more personal note, David’s nephew Hamlet Scranton who in Rochester, NY had to get his family to safety after a British raid at nearby Fort Niagara in late 1813. Certainly the strained trade relations hit the shipping industry hard, so it was a good thing that David had the farm to fall back on. In any case, David and his family remained in Nova Scotia regardless of where his sympathies may have laid.